Hello Everyone, Today in this post We TechTalkies365 Team is Going to share an interesting Steps to Add New Bank Account in BHIM App or you can say an easy way to Use Multiple Bank Accounts on BHIM Application. So, If you have Two bank accounts with the same registered mobile number and you want to add both bank accounts to BHIM App, Then we must say you are at the right post. I Hope most of us faced a problem like when running out of sufficient balance in one of your bank account and it’s really urgent for you to send balance using BHIM UPI. But Don’t Worry Guys, After Latest Updates from BHIM app, users can now connect 2 bank accounts in BHIM app. To use Multiple bank accounts in Bhim app all you need to do is just Follow the complete post from the begening to the end. Before Going Forward Let me introduced about the BHIM The fastest Money transfer app in India. The Indian Govt. 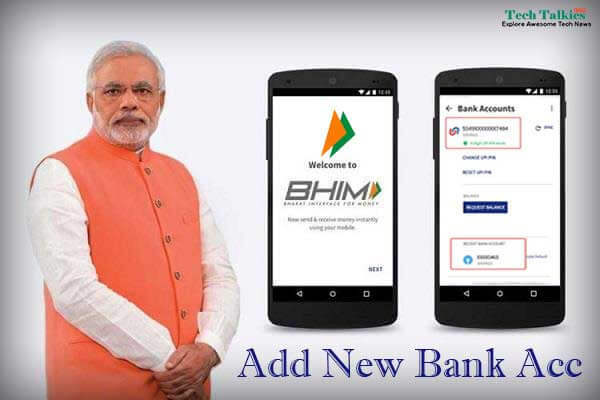 by our present Prime Minister Narendra Modi has launched the BHIM app after the demonetization on 30 December 2016, since then it gets so popular. Using BHIM Application Indian Users can easily transfer and receive money in just a few secs. Is it Possible to Add Two Banks in the BHIM App ? So, If you are searching on Google Is it possible to connect two banks in the BHIM app? then you are going to the proper and right answer to this question. Yes, It is 100% True that Now you can Use 2 Different bank accounts in Bhim app, but the problem is if you have two accounts in two different banks then you can only add one account at a time into your BHIM application, if you want to use your new bank account within BHIM app, you need to follow the steps given below, By changing your account and following the same registration process you can easily Add New Bank Account in BHIM App. The App is User Friendly. People can easily access their bank accounts. India’s Fastest and Secure money Transfer application. QR scanning is also a key feature for a seamless experience. Request Money Feature will allow you to request money from any user using Bhim app. This is the Main gateway of every application which allows you to transfer money or send money in India. While shopping or Purchasing anything online, you can check out your cart using Pay by BHIM UPI/BHIM. BHIM also allows users on in the installation of the Bhim application on their smartphones, receive cash back as rewards and the existing users can get more balance on their accounts. how’s That?? Now if anyone is using their SBI as their Primary account on the Bhim app and wishes to link their second bank account which says UBI, in the same BHIM app, all you need to follow the easy steps given below. Make sure the Bhim application installed on the Same Bank Registered mobile number as well. 1. So, The Very First Step you need to Install the Bhim app from From Here or you can also download Bhim App From Your Google Play Store. 2. After Installing the application on your device opens the app. 4. Select a BANK ACCOUNT under the “My information” section and you will arrive on the short bank details. 5. Now, Tap on 3 Verticle dots at the top of the right corner of your mobile screen in the BHIM application. 6. Now You need to Tap on Change bank account option. 9. Your Bank account details will be automatically retrieved. 10. Follow the detailed instructions. 12. Activate it and you will land back to the Bank Account page. That’s it, Now You can follow the same steps for as multiple times you wish to add a new bank account on your Bhimapp on a single device. All the accounts you add would be always listed on the Bank Account page and at any time. You can select your default or main account. So, by following this steps you can use Multiple Bank Accounts in BHIM app. Facebook for Creators vs YouTube Earning | Who will pay more? In our Second Method for Adding a new bank account to BHIM app by using USSD option on the same device, just build a BHIM account using USSD method as given below. First of all Dial *99# right from your registered phone number. Next, You need to tap on “My Profile” Option. After that, Click on change bank account. Then, Enter Your Bank’s Name in which you have your Bank account. Next, you will get guidance to add your bank account just follow that carefully and complete the process of connecting a new bank account in BHIM app. Finally follow the onscreen process to register your Bank [UBI for Example) banks account on BHIM, like set your passcode etc. And after successful registration on BHIM app by using USSD method all you need to do is just open your BHIM app, and Tap on Bank Accounts. Remember: Make Sure your UPI address will be the same for your both Banks. We hope this guide helped you in adding 2 bank accounts in Bhim App, In case if you have any quarries of having any asking feel free to put your comments below in the commensts section.